In case you haven’t heard, there is a big hullabaloo in Washington over the bankruptcy of Solyndra, a solar energy manufacturer that was developing a new product. The U.S. taxpayer is on the hook for a half-billion in loans, and the company executives are being hauled in before congress for hearings. As a result, congress is talking about cutting green energy research loan guarantees. Let’s get something straight. The technology that Solyndra was developing was no miracle product. They were taking existing thin-film solar electric technology and stuffing it into a glass cylinders assembled into large panels. Ok, that is an over-simplification, but generally there was nothing earth-shattering about the technology. There was no huge leap in efficiency or cost to be had. Moreover, this was no secret. 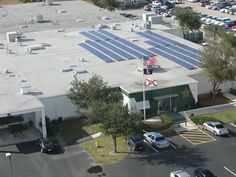 To be clear, this is NOT one of the same proven solar energy products that is installed every day in Southwest Florida. 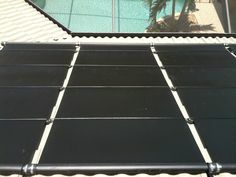 There are two basic types of solar electric modules. The conventional solar module is with what’s called crystalline silicon. These are the glass covered, aluminum framed modules that you are probably used to seeing. The newer type is called thin-film. As the name suggest, thin-film is thin and flexible, and can be installed with an adhesive. That certainly sounds appealing, and the cost has decreased dramatically on a dollars-per-watt basis. In fact, the cost per watt is lower than the crystalline module counterpart. However, there is one major problem – thin-film modules do not produce nearly as much energy in the same amount of area as the proven crystalline modules. Solyndra was taking this relatively inefficient thin-film technology and embedding it into a relatively expensive glass tube assembled into lightweight panels. I was at the Solyndra booth at Solar Power International in Los Angeles in 2010. I was actually impressed with the idea, and saw one fantastic application for the technology in Florida. Since there is virtually no wind uplift on the panels, they could be installed on flat roofs or the ground without heavy ballast or roof attachments, and still meet building code requirements. 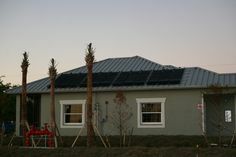 In fact, when I was asked to bid on the project to put solar on the Fort Myers City Hall, I briefly considered Solyndra panels. In the end, they could not produce nearly enough power in the space allotted to meet the specification. There was also a concern about glass breakage. The straw that broke the camel’s back was that crystalline solar modules have dropped in price dramatically in the last couple of years. This drop in price made it impossible for Solyndra to compete with existing technology. The two technologies are nearing price parity, and thin-film has become a far less attractive alternative except in very specific circumstances. I am not defending the actions of Solyndra executives. In fact, congress may be deflecting the blame for the debacle, but that is just speculation on my part. I know little about the civil and/or criminal legal battle that is sure to be in the media for quite some time. What I do know is that this kind of black eye is not deserved by the solar energy industry as a whole, and the collateral damage is likely to spread all the way to Southwest Florida where I have already heard people talking about how this solar energy company bilked the government to the tune of 500 million dollars. Rest assured that what we are doing around here has nothing to do with cutting edge pie-in-the-sky technology. The solar I sell is practical, real, and proven. Next Post: What Happens When My Solar Dealer Disappears?